Dazzling crystal beads in gentle shades on pretty bracelet with unique mood bead that changes with your body temperature. Platinum and teal crystals; cross charm, toggle clasp. A beautiful reminder that Prayer changes things. Boxed for giving, with sentiment. 7.5"; designed to fit most wrist size of most adult women. 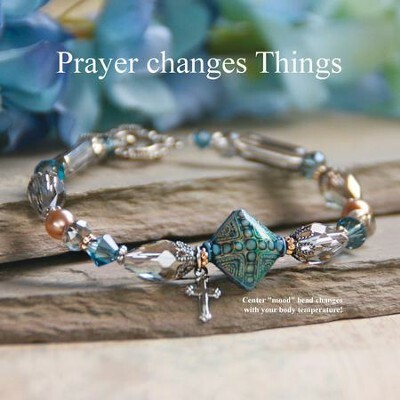 I'm the author/artist and I want to review Prayer Changes Things, Mood Bracelet.